If you haven’t read our shorter post, entitled “After All We Can Do Doesn’t Mean What You Think It Means”, we’d recommend reading it before continuing. This post is intended to expound upon that one. Many members of the Church think this scripture means that we must do everything that is possible to do to “earn our part” of salvation and only after we have completely exhausted ourselves physically, mentally, emotionally, and spiritually will Jesus come in with His grace and “make up the difference”; and pay the “rest of the price” of our salvation. The part that we couldn’t pay ourselves. This interpretation is false for many reasons. Let’s begin with logic. First, we will define each word in the phrase “all we can do” using a dictionary from 1828—the time period in which the Book of Mormon was translated by Joseph Smith. Every one, or the whole number of particulars. WE presumably includes all human beings who have lived, or ever will live. To have means, or instruments, which supply power or ability. DO, v.t. or auxiliary; pret. Did; pp. To perform; to execute; to carry into effect; to exert labor or power for bringing any thing to the state desired, or to completion; or to bring any thing to pass. In the context of this verse, I think we can agree that the things “we can do” refers to keeping the commandments or doing good works. It means the things we can do to be perfect on our own or to earn salvation on our own. So, this phrase, taken at face value, technically means: “after every single thing that we possess the ability to do to be perfect” or even “every right thing that is possible for us to do”. Technically, we possess the ability to be perfect. Meaning we never lose the ability to choose. It is only our choices that determine whether we sin or are righteous. Because of the gift of agency, we are free to choose everything for ourselves. We are free to act, and not to be acted upon (see 2 Nephi 2:26-27). We, and we alone, control everything we think, say, or do, constantly. We cannot commit sin in any way except through our thoughts, words, and actions. Therefore, we control our sins and our righteousness completely. Nobody makes us do anything. Nobody makes us think anything. Nobody can make us sin. Ever. In any moment of any day we are faced with the opportunity to “do righteousness” or to “do sin”. And the only thing that determines whether we do either of those things is our agency. God won’t force us to do good. Satan can’t force us to do sin. It is ALL up to us. ALWAYS. Therefore, in every instance where righteousness or sin can be committed, it is possible for us to do righteousness. We never lose the ability to do righteousness or to not do sin. We ALWAYS have the ABILITY to do what is right, and therefore we possess the ABILITY to be perfect. So Nephi’s words taken at face value literally and technically mean “we are saved by grace only after we have been perfect on our own merits. After we have chosen the right every time”. Obviously it does not mean that. It CAN’T mean that. That would defy the ENTIRE GOSPEL OF JESUS CHRIST. That would make the Atonement unnecessary. So it is therefore logically impossible for “after all we can do” to mean what it looks like it means. We must search for a different meaning. Some people have interpreted it to mean something like: “after all we can reasonably be expected to do”. The same faults apply to this concept as well. Because it says “after all we can do”, even by this alternate interpretation we would have to have done every single thing that was reasonable for us to have done right in this life or else we wouldn’t qualify for grace. Even one single misstep would disqualify us. Both of these interpretations diminish the role and power of the Atonement of Jesus Christ. For these reasons, “after all we can do” can’t logically mean what it looks like it means. What have ancient and modern prophets said regarding how we are saved? Paul is incredibly plain here. Some people in the Church would like to ignore these verses, suggesting that it may be a misinterpretation, but that would be a mistake. Paul plainly teaches that we are saved only by grace and not by our works. That does not mean that we don’t need to keep the commandments or do good. But it does mean that we aren’t saved by our works. When President Uchtdorf says “after does not equal because”, it means that after never equals because. We are never saved because of all or anything that we can or have done. Or, in other words, not a single one of our works go toward earning any portion of our salvation. Ever. The words “wholly” and “alone” are important. Let’s not discount them. We rely completely and entirely on Jesus Christ’s works for our salvation. That means that we don’t rely on our own works at all. He paid the entire debt. It’s solely on His merits, mercy, and grace that we are saved. When Jacob says it is “only in and through the grace of God that [we] are saved”, he means ONLY. He doesn’t say it is mostly through grace that we are saved. He doesn’t say it is through grace and some of our works that we are saved. He doesn’t say it is through grace and all the works we can reasonably be expected to do that we are saved. And he certainly doesn’t say it is through grace and all the works we can possibly do to save ourselves that we are saved. 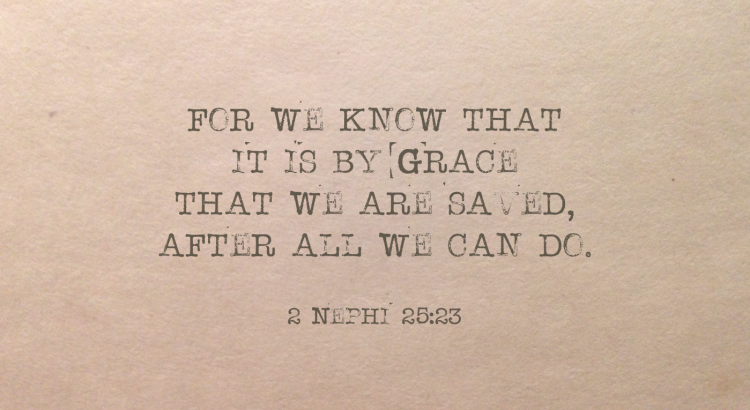 He says it is only through grace that we are saved. DO NOT IGNORE THE WORD “ONLY”. It is there for a reason! That is the point of his statement. Even after you are reconciled, it is still grace that saves you. So if we are saved entirely by grace, there is nothing we need to do… right? Oftentimes grace is misinterpreted as being saved unconditionally. If you just believe in Jesus, then you are saved. But that’s not what it means or how it works. The grace of Jesus Christ is a free, unmerited gift that we will never deserve. But at the same time it carries a condition that we must meet to receive it. So what is the condition to receive His grace? What must we do to be saved? The condition to be saved is REPENTANCE. In fact, in the very verse of scripture that this post is based on, Nephi states that he labored diligently to persuade everyone to believe in Christ and to be reconciled to God (see 2 Nephi 25:23). Jacob uses the same word: reconcile (see 2 Nephi 10:24). So what does it mean to become reconciled to God? To conciliate anew; to call back into union and friendship the affections which have been alienated; to restore to friendship or favor after estrangement; as, to reconcile men or parties that have been at variance. Reconciliation means to take two people or things that have become estranged or separated and to make them unified again. If you have two lines that run parallel to each other, you could say they are in union. They are heading in the same direction. They are aiming toward the same destination. They are the same. If one of them then gets tilted off course, they are incongruous. They are not unified anymore. They are estranged. They are not heading in the same direction or aiming toward the same destination. The two lines need to be reconciled. They need to be put back in line with each other. The estranged one, the one that is tilted or veered off course, must be straightened out again to become one with the original. This is like us with God. Repentance is how we become reconciled to God. President Uchtdorf says that believing in Christ (faith) and becoming reconciled to God (repentance) is what we can do and is our task in mortality. We have discovered what we must do to receive salvation! We must have faith in Jesus Christ and repent of our sins! This means that we should focus on teaching faith and repentance. The tenets are the appendages. The branches of the tree of the gospel. Faith and repentance are the focal point. (The Atonement is really the focal point, but faith and repentance are how we apply the Atonement). So when President Uchtdorf said, “that is what we can do! And that is our task in mortality!”, he is saying the same thing. He is saying “nothing can save this people except it be repentance and faith on the Lord, Jesus Christ”! He is encouraging us to focus on those two things. The point that Nephi is actually trying to make in this verse of scripture is that even after all that we do end up doing, it is still only the grace of Jesus Christ that saves us. We are saved by His power, because He is the only one who has that power. Because He is great. Because He is God. Because He is the Savior of mankind. Not us. We are nothing without Him. He. Saves. Us. Totally. Why keep the commandments then? It seems contradictory, doesn’t it? We are saved entirely by grace and not of our works, yet we are told by Jesus Himself to keep His commandments. In fact, we have been told to keep the commandments by every prophet we have on record. So what’s the deal? Why are we to keep the commandments if they don’t earn any part of our salvation? By what power are we to keep the commandments? So why should we keep the commandments? We should keep the commandments because we love Jesus and are so grateful for his saving gift of grace. And may we also add that we should keep the commandments because we want to be like Him and we want to feel comfortable in His presence (see Wilcox, “His Grace is Sufficient”, Ensign, Sep 2013). Now, it may not be immediately clear what the difference is here. If we keep the commandments to show our love to Jesus, or we keep them out of fear or obligation, we’re still keeping the commandments. What’s the difference? By what power are we to keep them? This may sound like a strange question. But it is the key to understanding this whole grace vs. works confusion. Most of us try to keep the commandments by our own power. Meaning, our own limited human ability to choose the right. Our own weak ability to control our thoughts and our actions. Our own frail ability to control our emotions. That is how many interpret “all we can do”. That we need to do everything that is possible to do to earn salvation by our own power first and then Jesus will come in and make up the difference. That is a very exhausting and lonely road. A road with no end in sight. It’s a road that keeps us focused on ourselves and our own efforts, taking our eye off of our Savior, Jesus Christ. It’s time to take a different road. A more hopeful road. A road with Christ by our side. A road filled with the enabling power of His grace that will help us actually keep the commandments. Not only will the grace of Christ come into our lives and save us, but it will also change us. It will not only make us want to keep the commandments, but also make us able to keep them. When we have been changed by grace, we are no longer just the simple, weak, sinful human beings we were before. When we are changed, we are literally changed. We become different. We become infused with the power of Jesus Christ. We become infused with Godly power! There are many examples of this in the scriptures. Their hearts had been changed. They didn’t even want to sin. And therefore they didn’t. But it wasn’t difficult. It was just their new nature. They weren’t trying to force themselves to keep the commandments on their own will power anymore. They just kept them because they had become righteous in their hearts. That is the power of the Atonement. That is the power of Jesus Christ. Quite often in the Church we focus on the need to keep the commandments but forget to talk about the only way to really do that. The only way is to be “born again”, as Jesus taught (John 3:3), and to have “this wicked spirit rooted out of [our] breast” as King Lamoni’s father described (Alma 22:15). The only way is to experience a mighty change of heart. And how do we get a mighty change of heart? We have faith and we repent. Over and over again. Every day. Our entire lives. The goal should be to have a changed heart, not to try our hardest to keep the commandments all the time. Keeping the commandments is a byproduct of a changed heart and should be done out of love, not fear or obligation. Now, there is merit in striving to keep the commandments even before having experienced a mighty change of heart. Keeping the commandments puts us in tune with the Spirit. And the Spirit is the vehicle by which His grace enters our lives. The Spirit uses His grace (the power of His Atonement) to sanctify us, change us, and enable us to actually keep the commandments. However, notice that the motivation is to get in tune with the Spirit, not fear or obligation. Keeping the commandments out of fear or obligation will never lead to a changed heart and it will almost certainly lead to stress and possibly to getting burned out. In conclusion, the gospel of Jesus Christ should never be a stress. It should not be a strain. It is empowering and life-giving! It brings hope! Please don’t ever keep the commandments to earn anything or to avoid punishment. Keep them because it has become your nature to keep them. Because you want to be like Jesus. Because you love Him (see John 14:15). If everything we do is done with His help, life truly will be easy and light because we will be taking His yoke upon us (see Matt. 11:28-30). Jesus will enable us and change us through His grace if we just have faith in Him and repent of our sins. So please don’t try to be perfect on your own. Just have faith in Jesus Christ and repent. That is all we can do.